My Ride on the Timber Trail. Or: Always have a backup plan. My co-worker is heading to New Zealand with her husband for the Christmas break. Jealous is a strong word, but definitely appropriate here. I'm so jealous. My wanderlust is rearing her lovely head, and I've fallen down the rabbit hole that is Erica's Instagram several times. My co-worker won't be riding bikes- opting for hikes and postal tours instead- but she wanted to hear about my time on the Timber Trail. Because the weather here in Austin reminds me of our first few days in New Zealand, before the rain, I figured I'd share the story with y'all here. Without further ado, here's my tale about the Timber Trail. First of all, you should know that I’m lucky to be surrounded by really accomplished and really strong riders. So sometimes it’s easy for me to bite off more than I can chew when it comes to rides, like steep rolling hills through a state park on platform pedals and a steel bike. 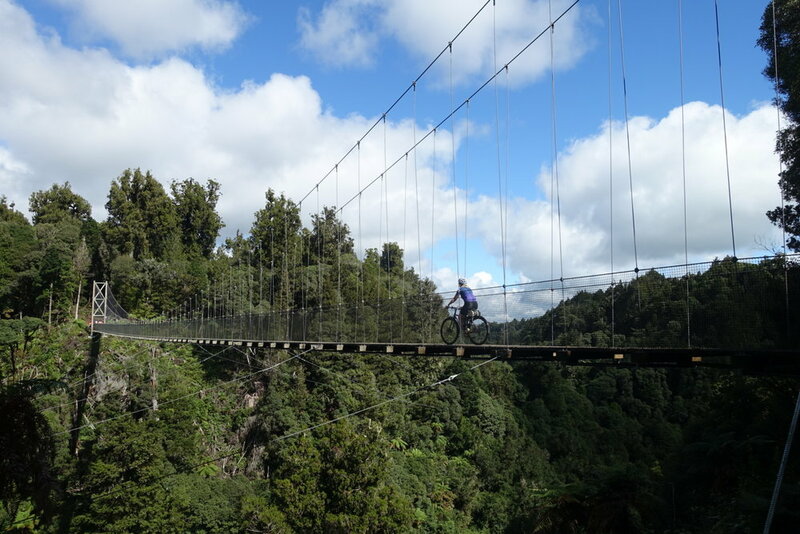 Or one of my favorite adventurs: 52 mile (83 km) trail ride in New Zealand. But that’s just what I did. 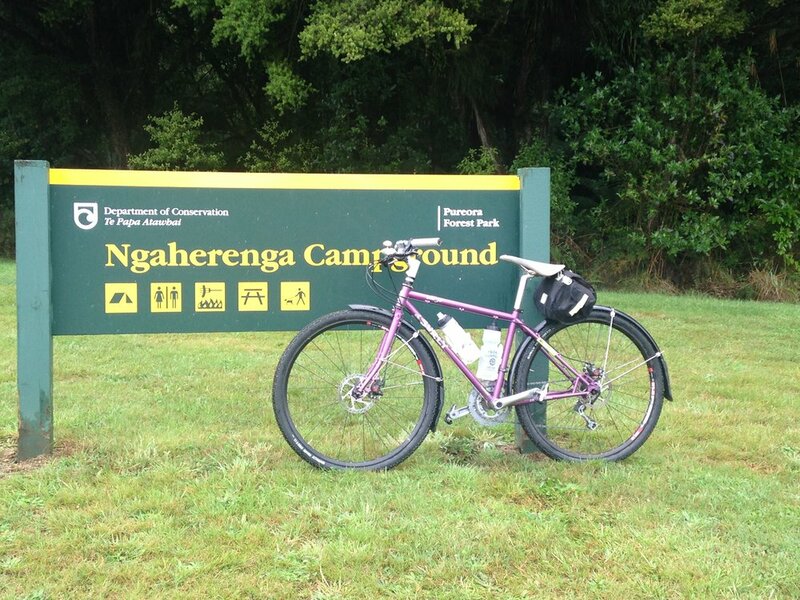 As New Zealand transitioned into fall this past March, I joined my husband’s cycling club in boxing up our bikes to explore the mystical trails (and vineyards) on the north island. This was the first time I had flown with my bike, not to mention my first time seriously attempting trail riding, but I figured I’d cross that bridge when I got there. And believe me when I say, it was some bridge! After three flights and navigating customs with my bike box, we headed to our home base in Waimarama— after we stopped at a Hawke’s Bay vineyard for wine and oysters. This trip was off to a delicious start! We took advantage of the sunny weather and built up our bikes while we waited for the rest of our crew to make it into town. After everyone made it, some of us stretched our legs by riding down to the beach to watch the full moon rise over the ocean. This wasn’t the last time I wanted to pinch myself. We made the decision to explore Hawke's Bay and the surrounding areas at our leisure. I’m glad we made that call because the weather was unpredictable and— being from Texas— we were hoping for sunshine on our rides. That being said, I made sure to grab my Search and State jacket, especially because the possibility we’d get rained on was always a strong one. After we recovered from jet lag, explored the roads of Waimarama, and indulged in plenty of regional wine, we knew it was time to pack our bags and head inland, for the area around Lake Taupo— we’d spend some time melting in the thermal pools before heading to the Timber Trailhead to camp for the night. Sparkle horse was a champ! The thermal pool was as amazing as it sounds, worth the detour if you’re ever in an area with one. We loaded back into the cars as the clouds started crowding out the sun and made it to camp before the rain started. A word about our camp: We rolled into the Ngaherenga Campground and I don’t think any of us were prepared for the lushness of it all. Bright rays of sun were still streaking out from the rain clouds, spotlighting the rich, deep green flora. Birds (and maybe dinosaurs) were calling out to one another and the only other sound was a family in a camper making dinner. Yes, this would be a fine place to stay the night. We started setting up our tents as the first sprinkles of rain started falling. My husband and I just finished securing our rain-fly as the deluge started. High-fiving as we zipped up the tent, we started unrolling our sleeping bags and making sandwiches. I thought our stuff was damp because we set up in the rain. That thought didn’t last long: a few drops on my head later, I realized our rain-fly was leaking. All over. Doing what any former girl scout would do, I used the wrappers from our cheese slices to cover the seams of the rain-fly. That should do it! It didn’t. Immediate re-packing of the bags commenced and we dashed for cover in the cars. 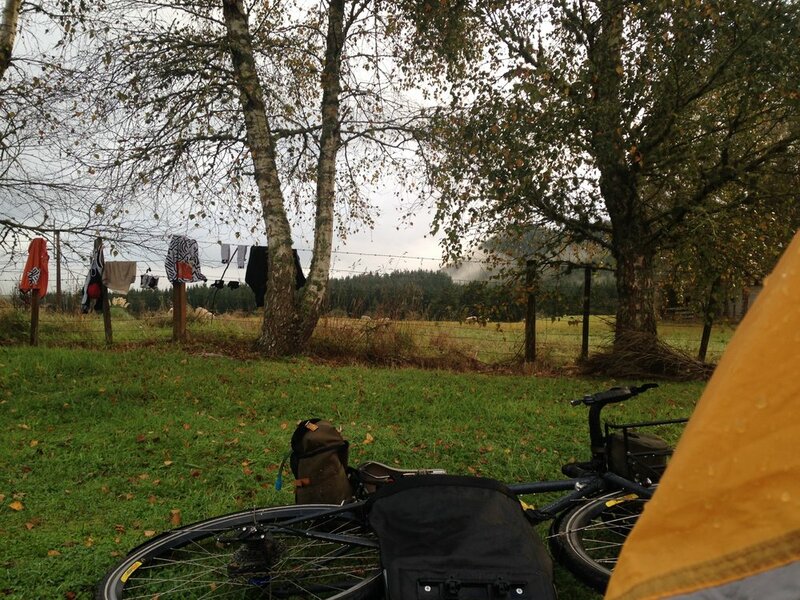 Even though I was 90% sure I’d have to snuggle with my Surly overnight, I looked around at our friend’s (waterproof) tents, listened to the sounds of the birds mingling with the heavy rain drops on the leaves and thought, “it’s pretty hard to beat this.” We eventually figured out we could use a horse blanket, conveniently in one of our trucks, to cover our tent. We did that, went in for round 2 of unrolling the sleeping bags, and stayed pretty dry. Sure, we smelled like a barn… but it was a dry barn! My favorite part of camping is hearing the camp grounds come alive again. The unzipping and zipping of tents, sleepy voices greeting each other, birds letting you know the sun is about to rise— all that and the promise of camp coffee. The rain was gone and it was a clear and bright morning. The perfect morning for heading out to the Timber Trail on the Pureora to Ongarue trail. This is where I should tell you that I’ve never been mountain biking. I ride road and I commute. So you can imagine the flak I caught for only having road shoes and pedals. But, it’s what I had and what I would use. We packed up our gear, made a plan with our friend who was hiking instead of riding, and ventured out. As we entered the Pureora Forest, we were passed (on the right— which felt real awkward) by a family on full suspension bikes. “Hope you’re still smiling at the end,” one of them called out after seeing our steel frames, sans suspension. I liked challenges— clearly— and felt pretty sure there would be smiles the entire ride. Look at that smile- Oh to be Young and Naive! I let the guys with more experience ride ahead, as I did my best to take in the jaw-dropping scenery and ride through the mud caused by the rain. At one point we turned out of the forest and all of a sudden we had a clear view of the forest- having ridden 980m above sea level. My husband and I regrouped with the guys and we descended back into the forest. I got a crash course in handling— literal at some points. And because my pedals were caked in mud, I managed to stayed clipped in (and on my bike!) on a particularly tight turn. I consider that a win. The puddles were no joke, and we all did our best to take the same lines in order to avoid rutting out this incredible trail. I was sore, bleeding, and stuck to my bike and yet still having the time of my life. Still smiling… but definitely grumbling a little more than at the start of the day. And then, the first suspension bridge. This. This was the reason I was on my bike. I soft pedaled across looking out— not down! I was grateful for a lot at that moment, but especially grateful no one swayed the bridge as I rolled over. We kept riding, but it was getting tougher and tougher for me. It was humbling to realize that this time I bit off more than I could chew, and I didn’t have the skills or the suspension I needed to get me to Ongarue. Sometimes you want to ride your own bike. Other times, renting a bike with suspension is a wonderful idea. Carefully assess the situation and then find a bike that fits. After some serious gut checks, I made the call to pull out of the trail and wait for everyone else to finish the ride and come get me. We saw a sign for the Black Fern Lodge and I thought that sounded like a pretty darn good place to wait. One of the guys decided to hang out too. He had just spent the previous two weeks riding all over the South Island, so he was ready for an extended snack break too. We said “see-ya!” to our group and ventured toward the Lodge. And ventured… and kept venturing, until we came to a locked gate that said private land. Coming from Texas, we know not to mess with private land, so we headed back to the road. We figured our friends would take that road to pick us up, not factoring in another entrance. Always factor in the possibility of another entrance. We ate our snacks, lounged in the sun, and built pebble sculptures all while watching the shadows grow longer and longer. We knew we had a few hours to wait, but as the sun started to set, we started to get pretty nervous. Praying no one had a mechanical issue, or there wasn’t a problem meeting up with our hiking friend, we waited and waited. A couple camping near the road took pity on us and suggested we wait for our friends at the Piropiro campgrounds. All roads passed through Piropiro and it sounded a lot better than the side of the road. Always have a plan B and C, in case your plan A is actually on private land and you don’t have cell service. The couple dropped us off and told us they had a friend camping there, and he would look out for us if our friends didn’t show up soon. It was dark by this time. We were still in Lycra and I had run out of chocolate covered raisins. Heartened by the fact that we could pick up the trail after a night’s rest— and that we weren’t completely in the middle of nowhere, we kept our positive mental attitude as best we could and started coming up with a game plan. We noticed someone walking towards us where he stated— it was definitely not a question— that we were cold and hungry. Right on both accounts. Somewhere in New Zealand is a gentle giant named Murray, to whom I will forever be grateful. Without hesitation (well maybe there was some, but I didn’t see it) he and his family welcomed us to their campsite, started a fire, fed us and let me borrow a sweater. If I wasn’t so anxious to be reunited with our group, I would have cried tears of joy. We ate around the fire, taking turns between telling our story of the day and coming up with plans for finding our friends. We found out that one member of our party had been through the campsite around sunset, looking for the Black Fern Lodge. Not long after, headlights swept across the campground and settled on my bike. We were found! There were introductions, hugs and hearty “thank-you’s,” all around. We loaded up the bikes and headed down that dusty, windy road to our second camp.It started raining again that night, and we slept under the horse blanket again. Our bikes were rinsed clean of Timber Trail mud when we woke up the next morning, and a dog raced around our tents while sheep looked on. After we packed up, we headed back to the coast and to more familiar roads. I hope to get back to the Timber Trail again. This time with a full suspension bike and a backup plan. This year, possibly more so than in years past, I'm craving sunshine, camp fires, and sitting on the patio watching the sun set. I think these feelings blow in with spring weather- new growth on trees, cedar fever has passed and the sun staying up just a little longer each day. I know... we didn't really have a true winter, (that's not a humble brag, swear!) but man, I've felt cooped up! It could also have to do with the adventures planned for this year: camping this weekend, New Zealand in a few weeks, a West Point wedding next month and then heading to Nebraska in August to celebrate another wedding (and celebrate we will!) Whew! It hit me as I turned the calendar page yesterday... this is going to be a big year full of my favorite people and activities! There's a lot that I want to happen this year (see above... big year), so I'm pretty clear on my short term goals. What's a little surprising is my 5 and 10 year goals aren't as clear. This is a new feeling for me and, well... it's unsettling and freaking me out a little bit. Rather than dwell on that- because there are plenty of other things to freak out about (and really how lucky am I to be able to have options)- I'm going to see how 2016 shapes up and then take it from there, taking my own advice from January. What is making me happy right now? What hobbies/books/activities have I been drawn to lately? Who do I look up to, and why? If I had extra time, how would I spend it? How am I spending my time now? Actually, I'll join you in this exercise! We can navigate these uncharted waters together. Okay I'll stop. So bring on the adventures and the goals, March (and 2016 onward) is looking mighty fine! Photo by Dad. I sure miss those El Paso sunsets! What is the "Kick in the Pants" you need? It was Christmas night and my mom, my husband and I were outside looking for the full moon through the passing clouds. My mom suggested we take the golf cart to see if we could chase the moon and J agreed. I, on the other hand, wanted to get back to the fireplace and my book. No one was surprised. Then J said, "She'd rather read about adventures than have them." Well ain't that a kick in the pants! Yes, it's true I'd choose reading above many activities. And yes, I generally am the first to turn around when I see a "Road Closed" sign. But I do enjoy adventures, I just need a nudge... or a kick in the pants! Our honeymoon is an excellent example. This being our first time to Greece, I wanted a detailed travel itinerary. I claimed it was for my parents' peace of mind, and it was, but it was also for me. J suggested we just wing it. ... After my heart started beating again, we compromised: The first 3 days would be planned, and then we'd just go from there. That was the best dang trip I've ever been on. And you know what? There was even time for reading in between all of that adventuring we were doing! Sometimes, if we're lucky, it just takes someone asking, "what if..." or it may be a call out in front of your mom that makes you jump in to action. Sometimes the kick in the pants comes in the way of a job change- voluntary or otherwise. While I have no immediate plans to climb every mountain, I've made a deal with myself to at least be open to the idea of an adventure- of the unknown. To me, that looked like joining a professional group for women writers, and deciding to go on a ride despite the probability of getting lost. Where do you fall on the scale? Do you jump in with both feet or do you require a little nudge? Happy New Years Eve, friends! I savor the last day of the year as much as I celebrate the newness of the first, which is why I'm sharing my little year in review today. I'd love to read about your favorite 2015 memories in the comments! Without further ado, and in no particular order, I present my round up. Partnered with Swift Industries (a brand I adore) and rode my bike through two state parks with a gaggle of friends. Never forget the Park Road! Camped in my backyard with John to celebrate our 1st wedding anniversary. Was a contributor for Modernize! Bought a house with John and made it a home. Saw the one and only Ms. Lauryn Hill! Connected (and reconnected) with some incredible women at the final Texas Style Council weekend. Said good-bye to one of my heroes. Completed my 100 book reading challenge. Took John to White Sands National Park and showed him the joys of a well-waxed saucer. Will ride for breakfast tacos. Worked really hard to get my Sparkle Horse- #newbikeday felt really sweet when I did. Also discovered the joys of a road bike (so light)! Saw Stars perform Hold on When You Get Love And Let Go When You Get It live in Austin. It was almost as good as in 2014- when it was our first dance as husband and wife. Had so much fun training for the Rapha Women's 100 ride that our group turned it in to a weekly ride... with an emphasis on snacks. I wish you the absolute best in 2016. Take care of yourself and take care of each other. xoxo.